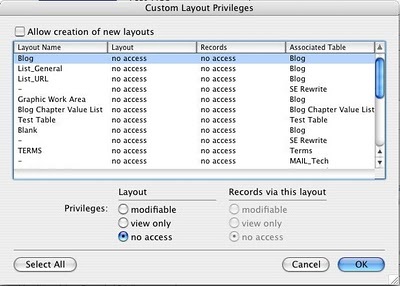 This setting will allow anyone, using this privilege set, to modify all layouts within the file. This setting will allow all layouts to be viewable but they cannot be modified. This allows full access to data entry, data editing and searches for data. This privilege settings will not allow it's users access to layout mode changes. All layouts will toss up an Access Denied gray screen over the layout. With this setting, all layouts can have customized and individual settings. From the customized layout access dialog box, you can choose if a layout can be modified, viewed or has a no access setting. This can also be setup for records on that layout with the same three settings. I could setup a custom privilege that allows a user to modify a layout but cannot see any of the data for any of the records when on that layout. They can add new fields, buttons and the like when in layout mode. When that user goes to browse mode, all the fields will say access denied. You can shift click multiple layouts and then give them the same settings for layout design and record access!